Next time you treat yourself, try holding the guilt hangover. There are plenty of ways to add to your inventory without adding to your clutter. In fact, some of these gift ideas might clear it away. Nobody's path to zen is the same. Check out this roundup of ways to escape and find your own. If you don't have the Dalai Lama's number, this app is the next most calming thing you can do with your phone. Packed with customizable, guided meditation sessions and a mood tracker, Aura's machine learning will soon tailor its exercises to meet your needs. Get it now: An Aura Premium: Lifetime Subscription is on sale for $79.99. When it comes to earbuds, it's equally important that you hear the music and not what's around you. For true immersion in the auditory Zone, these Bluetooth buds are tough to beat with their lightweight design, minimal one-touch operation, and CVC Noise Cancellation tech. Get them now: Cresuer Touchwave True Wireless Bluetooth Earbuds are 55 % off at $44.99. 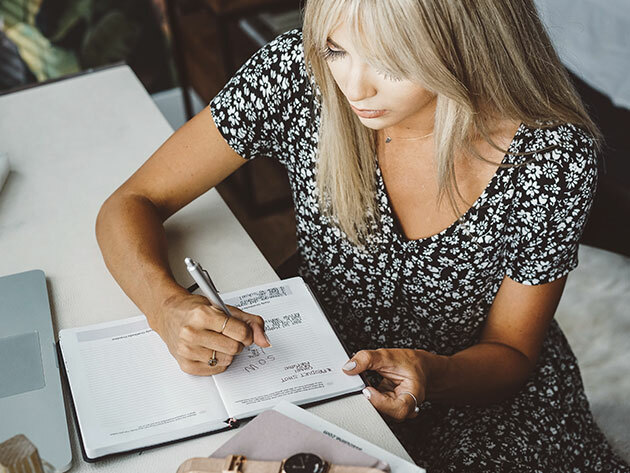 When it comes to productive mental exercises, the lost art of journaling can still be one of the best ways to stay grounded. This leather-bound notebook by Corso includes inspirational quotes on each page, and the company makes a donation to the Foundation for a Mindful Society with each purchase. Get it now: The Mindful Notebook is $26% off the MSRP at $21.99. Fitterclub streamlines the personal trainer experience, using a simple questionnaire to tailor a daily workout to your goals. Nutrition plans are part of the deal, and you'll be able to track your progress and access your workouts on any device, wherever there's an internet connection. Get it now: A 1-Year Membership to Fitterclub Personal Training is $19. The AI algorithms in this app allow you to build your meditations into a routine as productive to your mental health as exercise is to your physical well-being. Use the 3D soundscapes, breathing exercises, and multi-part sessions to find your center and remain there, and use the tracker to assess your progress. Get it now: A Lifetime Subscription to Mindfulness Meditation is 88% off at $49.99.